Perched on the eastern spur of Linden in the lower Blue Mountains, sat a project home partially completed in 2003. The new owners, a young couple, decided after suffering through several cold winters that it was time to renovate the house into a thermally comfortable family home. The clients originally wanted to maintain the two existing pavilions: one for guest accommodation and the other for ancillary spaces and create a new dwelling to the east, increasing floor space to accommodate a family and capture the surrounding bushland and easterly views across the Sydney basin to the harbour and city. Alexander Symes proposed an alternate way of thinking about the site with the main principles of respecting the bushland at the core and re-using as much of the existing built form, services and structure as possible to reduce waste and manage costs. From this re-interpretation of the existing “L-House” was created: a north-eastern pavilion for the parents, flowing to a new central family pavilion, which would navigate the level changes in the landscape to connect with the existing east-west pavilion, housing the children’s area, an office and ancillary spaces. This consolidation of the built form created a single eastern elevation where the sweeping views to the city skyline could be appreciated from multiple living spaces. Conversely, the L-shaped house formed a new western entry to the property. The low window-to-wall ratio on the west enabled a celebration of the sleek zincalume cladding. The simplicity and rhythm of the material provides a striking contrast to the natural bushland, with the zincalume shimmering on approach, reflecting the colours of the day. The material however also serves a greater purpose: fire protection. 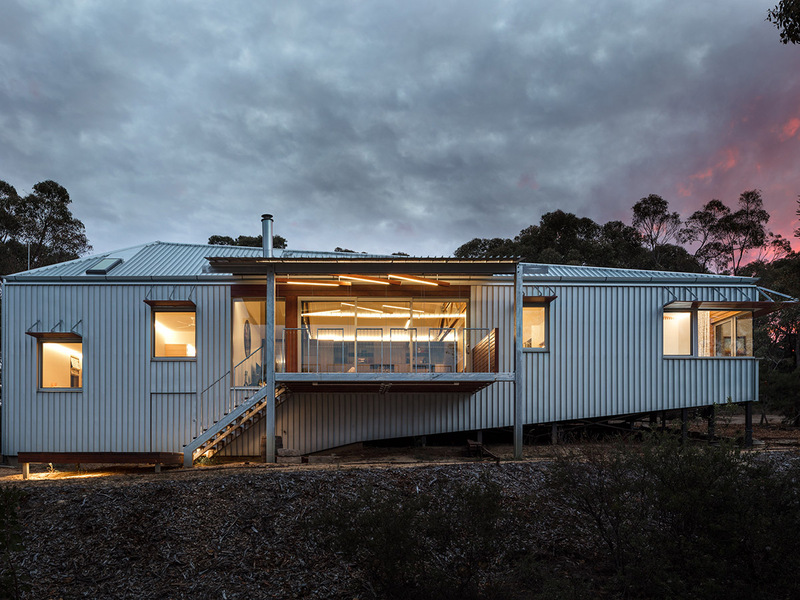 The close proximity of the natural bushland meant the external envelope had to be robust and non-combustible in order to meet the highest level of bushfire protection construction set in the original 2003 DA. As such, the house is effectively wrapped in zincalume cladding with bushfire rated hardwood used as feature elements along with BAL 40 rated windows. For an alteration and addition L-House achieves a solid NATHERS rating of 7.6 stars, well exceeding the 4 stars required in the 2014 s96 approval and still above the 6 star rating generated under the 2017 BASIX tool. Many initiatives have been undertaken to ensure L-House provides a high performance thermal envelope for its residents to cope with the extreme heat and cold of Linden, these include: stripping back the old pavilions and completely re-insulating, using thermally broken window frames and lowering the window to wall ratio. This means L-House has a lower peak demand which in turn reduces the overall residential demand on peak days, which Ausgrid estimates increases the size of their power stations by 147 percent.